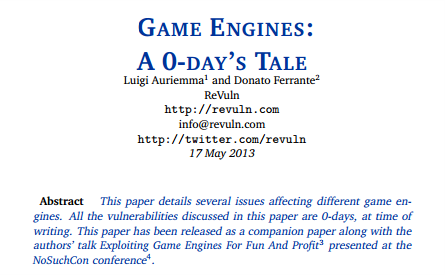 Exploiting vulnerabilities in the engines, the attacker could execute arbitrary code. Company experts ReVuln, issues dealing with cybersecurity, reported critical vulnerabilities in the game engines: CryEngine 3, Unreal Engine 3, Hydrogen Engine and id Tech 4, used in games Quake 4, Crysis 2, Homefront, Brink, Monday Night Combat, Enemy Territory: Quake Wars, Sanctum, Breach, Nexuiz, etc. exploiting vulnerabilities related to memory corruption and buffer overflow, attackers can carry out DoS-attack or execute arbitrary code. A hacker could create a malicious game server and register it on the master node. Further, he is able to carry out attacks on any user’s computer that connects to the server. This can lead to massive attacks on the gaming clans, resulting in one of the players side can get a very distinct advantage over the other servers, which will be subjected to DoS-attacks.